Happy 2014 to everyone! This year I am going to make more of an effort to include more savoury recipes on the blog that include heaps of veggies and nutrients in fun and delicious ways. But don’t worry, I will still be including some sweet recipes as well! 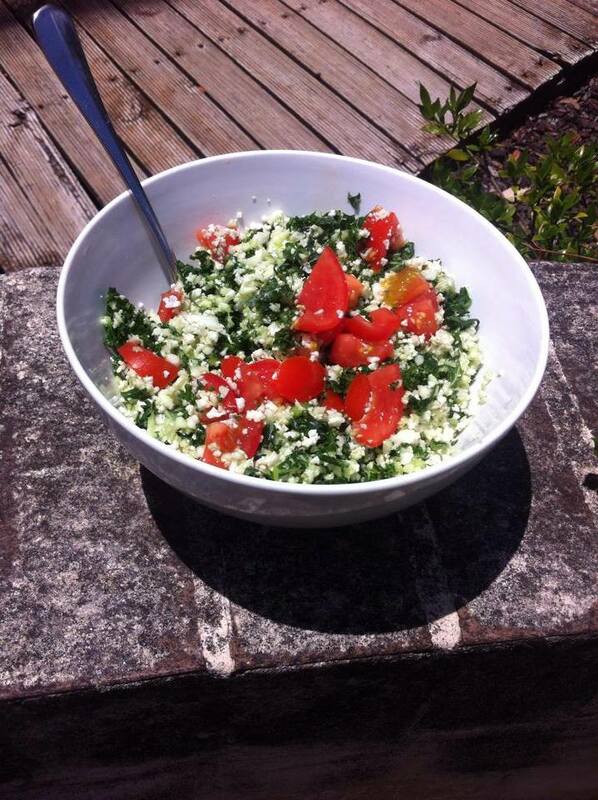 I feel that this is the perfect recipe to start off the new year; this is a delicious, healthier twist on traditional tabouli. It is wheat free and packed with so much goodness. This is a great option to take to a BBQ to have as a side salad or to have with dinner. As raw kale and cauliflower can sometimes be a bit harsh on the stomach, I have included apple cider vinegar as an optional ingredient in this recipe. It assists with digestion and adds a great flavour as well. Place all ingredients except for the tomato in a food processor and blend until the kale is in little pieces and the cauliflower is about as small as rice granules. Transfer all ingredients into a large bowl and stir through the diced tomato. Store in the fridge or serve right away!